We’re pleased to award Wigan Athletics young star, Victor Maffeo, with his Kingdom Goal of the Month award. The full-back, who regularly plays in the Under 18s, scored a right-footed, top corner goal against Morecambe FC in the EFL Youth Alliance. 67% of Latics fans were in agreement that Maffeo’s goal was the deserved winner. 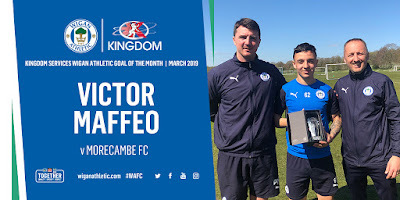 The full-back, who regularly features higher up on both wings, helped Latics to a 5-0 victory against the Shrimps and was recently involved in the Under 18s' EFL Youth Alliance title-winning 2-0 victory over Bury FC at Christopher Park on Tuesday. The next round of voting will begin at the end of April. Keep an eye out for the chance to vote for your favourite goal.